Enchanted Island Amusement Park | The Valley's Best Place To Take The Family! The Valley's Best Place To Take The Family! Hi! Pete the Parrot here! Welcome to The Enchanted Island Blog. I want you to know about all that’s happening here at Enchanted Island Amusement Park (or EIAP!). We always have cool, FUN things going on and this month is no different! Learn more about EIAP here. We’re still celebrating our 20th Anniversary! And we’ve got a lot of really cool things going on at EIAP. Coming up Feb 17th is our Night of Giving and Light the Night. One BIG Night, 2 BIG Events!! Pass the word here and here. You can be the first to find out about our specials and the latest FUN stuff at Enchanted Island. Just sign up over on the right side! Come by and play with me! Ride all our rides! You can have an awesome Birthday or Company Picnic here too! Book a Pete’s Package Birthday Party for a Friday and Receive $100 OFF any time! 2. Light the Night – 4:30 to 8:30 – FREE Bounces, FREE Entertainment & FREE Food (while supplies last). This is an outreach of Manna Ministries and Gracewalk Community Church. Come on out and enjoy our REALLY Big Night. We’ll see you here at EIAP! Click here for a downloadable and printable flier of this event! 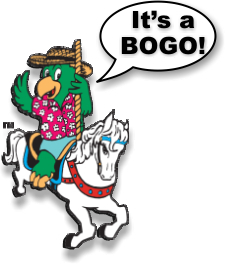 On Our Night of Giving Enjoy Unlimited Rides! And all Gate Proceeds Benefit the Mount Zion Baptist Church! 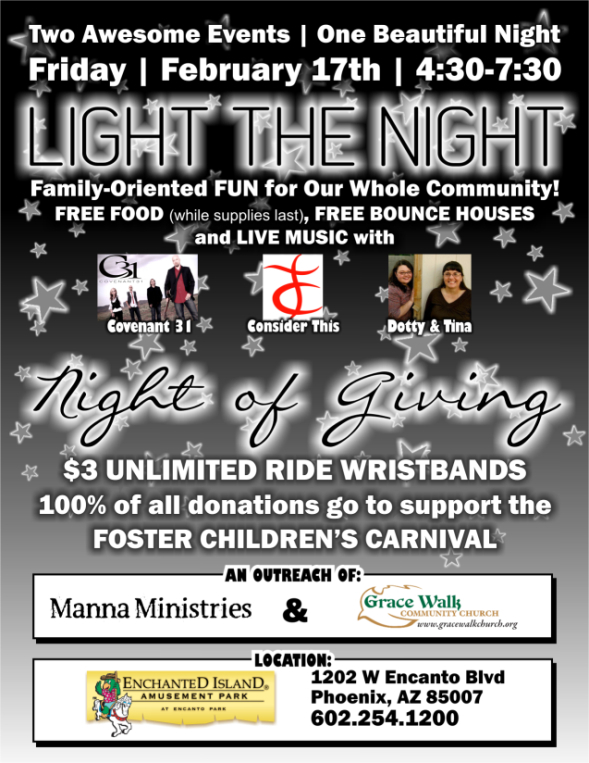 This Friday, January 20th, from 4:30pm – 7:30pm, is our next Night of Giving. Everyone age 1 and over pays $3 (cash only) to enter the park, but then they enjoy FREE, UNLIMITED RIDES! $3 per person – Gate Admission includes Unlimited Rides! All Gate proceeds benefit the non-profit group. This month it’s Mount Zion Baptist Church! Future Dates: Feb 17th = $3 Unlimited Rides for Supporting Local Charities and Schools. p.s. We at Enchanted Island love giving back to the community. On our Nights of Giving we provide the opportunity for a non-profit group to raise funds. At the end of the night, ALL the money raised at the entrance goes to the group. If you’d like more information give us a call: 602.254.1200 x222. Our January Special! Plus Some New Instructions! For the rest of January our special is Buy One Child Wristband, Get One Free! So come on over to EIAP! Bring all your friends! AND DON’T FORGET TO PRINT THIS OFF AND BRING WITH YOU TO TAKE ADVANTAGE OF THIS SPECIAL! I’m not sure if you know this but not only do we have FUN for kids ages 2 to 10, we also put on awesome (if I do say so myself!) and FUN Birthdays and Company Picnics for the kid in all of us! The fine folks at Lyons’ Roofing had a great time last week and they told me that… hey, wait! I’ll just let them tell ya about it. The Lyons’ Roofing Holiday Party was a huge success. Even though 100 more people turned out than expected, Johnny Cox was reassuring in accommodating and smoothly managing the unexpected overflow. It really was a pressure free experience, allowing everyone to thoroughly enjoy themselves. I know that owners, Rhonda & Paul LaNue were very pleased with the outcome of honoring their employees for their loyalty, creating a lasting memory of for all! There is already talk of next year’s party at the Enchanted Island!!! Thanks Belinda! We always want everyone to have a great time EIAP and we’re so glad that y’all at Lyons Roofing had so much FUN! Now, if you want to have a great Company Picnic like Lyons Roofing just did, or know someone who would, give Johnny Cox a call at 602.254.1200 ext. 222, and he’d be happy to tell you all about how your company can have the same! Or click here for a printable card that you can pass along! 7th Annual Winter Wonderland Express Starts Tomorrow! Come to Our 7th Annual Winter Wonderland Express Christmas Celebration Starting Tomorrow! Play in tons of fresh SNOW and SLED riding! Visit with Santa Claus for FREE at the North Pole and enjoy a FREE cup of hot cocoa and FREE candy canes. So Join us December 17 & 18, 2011, 10:00pm – 7:00pm each day! It looks like the weather should be great for tomorrow, but give us a call if you’re not sure… 602.254.1200 x221! AND we are accepting all discounts and coupons. No stacking please. Come to Our Christmas Celebration! So Join us December 17 & 18, 2011, 10:00pm – 7:00pm each day! It’s a wonderful Certificate that can be used as a gift for the Holidays. Get ’em for your friends, kids, grandkids, classroom celebrations, youth groups and more! It only lasts until tomorrow night, Sunday! Hurry! I'm here to tell you what's going on at my home, Enchanted Island, and to make sure you have FUN! Subscribe to our blog so you never miss what I'm up to! Be The First To Get Our Fun! Enter your email address and be the first to get our latest FUN, new posts and discounts! The picnic was great! Thank you so much! The food was fantastic and everyone really enjoyed themselves. We will definitely keep you in mind for future events. Have a great day! !